A problem is a weakness or business-related breakdown that can affect projects under certain conditions. The application tracks an official set of problems and their conditions. However, additional problems can be managed as well. The official problems are read-only. Title: The title of the problem. Risk rating: The risk score of the problem, which is analogous to the priority of a task. Text: A text description of the problem. A brief description of the impact of a problem not being addressed or mitigated. This field uses Markdown for rich text formatting. Common Weakness Enumeration Identifier: An optional list of Common Weakness Enumeration (CWE) identifiers that track common software weaknesses. Rules: The section titled Applicable to a Project when the following rules are met shows the rules for the problem. A problem always appears in a project if there are no rules. To edit a custom problem follow the steps below. Click Add Problem on the top right. 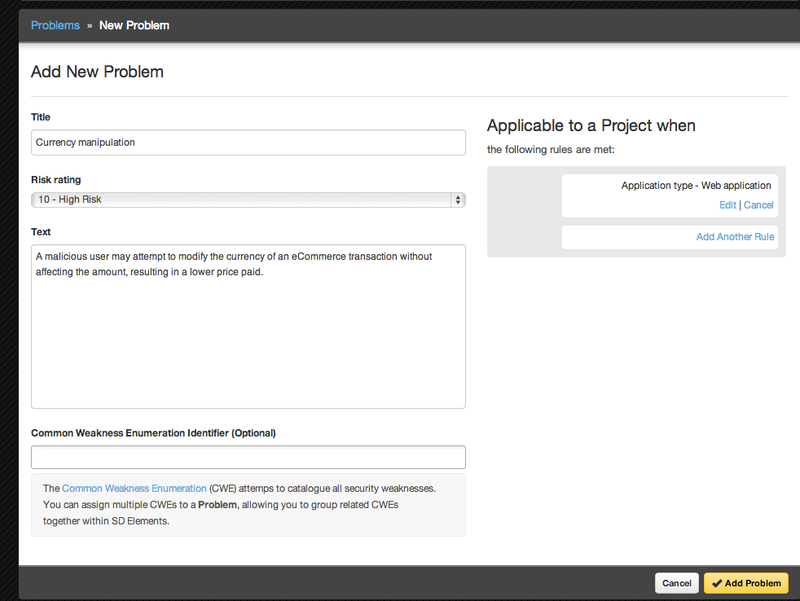 The problem is added to the system: custom or orginal tasks can be associated with the new problem. Delete a custom problem by first moving all assigned tasks to an existing problem. 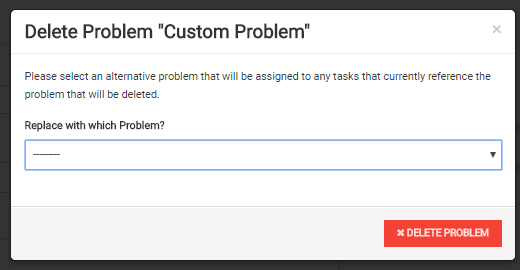 To delete a custom problem follow the steps below. Search for the problem and select it. Select an existing problem to move any affected tasks. The problem is removed from the system. All affected tasks are assigned to the selected problem. Examine a read-only version of a library problem by following the steps below. Custom & Original All problems. Problems matching the filter are displayed in the list view. A problem you select is presented in full detail, but you cannot modify it in this view.